Born in the South West in 1950, Anthony Amos was a self-taught artist whose life experiences at sea informed his much sought-after paintings. 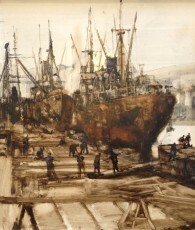 He captured the real working life of dockyards and sailors, conveying the raw energy of dangerous and dirty work amongst decaying salt-encrusted boats. Prior to his death in 2010 Dart Gallery represented Anthony and many of our customers collected his work. Occasionally these stunning paintings come back on to the market. Details of the paintings currently available are set out below.